With 5G Video, gains are massive and myriad – for consumers, device makers, providers and carriers alike. It “potentially enables an improved live-streaming experience and the possibility of ultra-high definition broadcasting”, the IDATE DigiWorld report stresses: “it could well open up a worldwide market with millions of smartphones and tablets as potential TV receivers”. As the Pandora’s box of 5G Video opens up and reveals its true potential, augmented reality (AR) and virtual reality (VR), HD live streaming, 360° views and downloading – until recently just simple dreams – will become the New Normal for digital citizens and consumers. 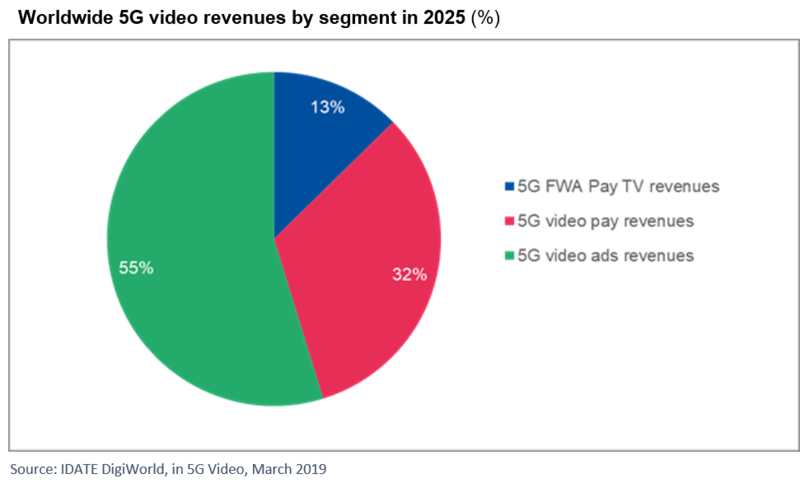 Throughout 2019, 5G Video is going live, in rollouts across the globe, often leaping on the momentum of key sporting events. In Asia-Pacific – the fastest region to leave the starting-blocks – the Rugby World Cup and the Tokyo 2020 Olympics will draw huge waves of interest. Equally, in the North American and European arenas, sporting encounters will trial and showcase 5G Video — including the qualifiers for the Euro 2020 football (soccer) contest. And while the initial growth spurt of 5G Video will be in the Media and Entertainment vertical, its lateral impacts on others – notably automotive and transport – will fast spread. Ultra high fidelity media: new highly immersive viewing with ultra-crisp, wide-view and deep-contrast pictures with unparalleled multi-channel sound, delivering both linear (live programming, streaming) and non-linear (on-demand) content. Public venue experience: large-scale event sites (cinemas, stadiums and ball parks) enhancing spectator experience. User-generated and crowdsourcing video content: people and objects will capture and share content in the cloud, using high upload bandwidth. There’s work ahead, believe media professionals on standards and content quality, with high expectations of 5G broadcasting. Immersive media: 5G capabilities will enable highly interactive video experiences at home, in public venues and on the move – but, first, there’s some familiarisation to be done. New use cases – and incremental opportunities — will follow, predicts IDATE DigiWorld. Beyond clear prospects for enhanced video (including FWA) and 5G broadcasts, the value chain will morph, driven by innovation and content. Market models and solutions will fast emerge. The report reviews and documents dozens of cases and players in all, helpfully placing them in the broader context of 5G. Given the commercial launches set for 2019 and 2020, 5G will be mainstream by 2023. At that time, there will be some 800 million SIM cards in use, before soaring to 2 billion 5G SIMs in 2025. A truly remarkable growth pattern. Distilling the extensive data of the IDATE DigiWorld report, the market overall will expand to an exceptional 145 billion EUR by 2030. The leading region will remain Asia-Pacific, followed by the USA and trailed by Europe. There are, all the same, notes IDATE DigiWorld, limits to growth. Consumer enthusiasm is hotly anticipated but not yet proven – here, IDATE DigiWorld nudges the reader, the price tag is a key determinant. Second, business models have to shake down, firming up the promises of both pay and advertising-based revenue. Third, innovative thinking will be needed to create and maintain new methods of distribution and coopetition between traditionally fierce competitors. And just who will take the lion’s share of this market? : the front-running telcos, or the mid-league media players, or the ascending Internet giants with their leading roles already in data and Ai, AR/VR and advertising inventory and revenues? Buy our last report: "5G Video: Game-changer, market-booster of the decade"
IDATE DigiWorld offers you to share your feedback and your point of view on the subject through this survey.